Beyond Organic. Our standards are above and beyond what the requirements are for organic certification. All Natural. We never use Hormones, Antibiotics, Pesticides, Steroids, Artificial Fertilizers or GMO. Our cattle spend 365 days a year eating grass in our pastures. They are never fed grains. The only supplements they receive are natural mineral salt and organic dried kelp. We provide the best grass for our cattle through Managed Intensive Rotational Grazing. This involves moving our cattle daily with portable electric fencing, keeping the cattle moving away from their manure and onto clean fresh grass every day. This is not only beneficial for the cattle’s health, it’s also good for the land, allowing the pastures time to rest and recover. Our cattle drink clean water from portable water tanks. Our ponds are fenced off keeping the manure in the pasture where its needed to fertilize the grass and out of the cattle’s water supply. Our cattle are processed at a local state inspected facility, located just 10 miles from our ranch. After dry aging for 14 days the beef is custom cut, packaged, and ready for pickup. We are a small family owned ranch located 40 miles north of Tulsa, just outside of Bartlesville, Oklahoma. 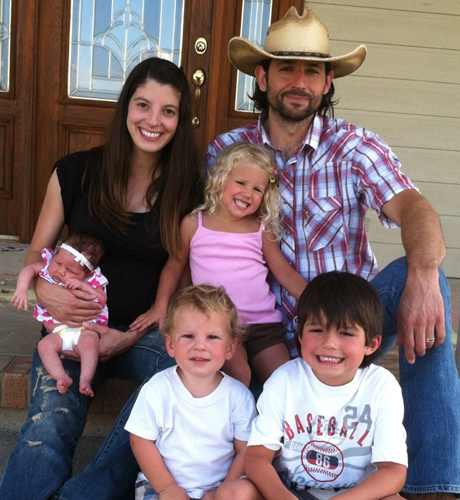 In 2010 our family’s health improved tremendously after we switched to a diet full of healthy all natural grass fed beef and vegetables. Motivated by this change, we set out to raise the healthiest, best tasting beef anyone has ever had. We spare no expense in time or cost to care for our land and our cattle. Please look around our site and contact us with any questions you have.